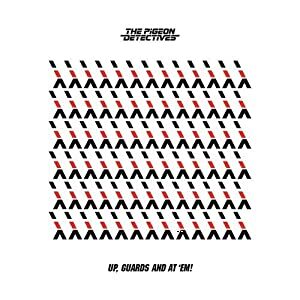 The Pigeon Detectives – Up, Guards And At ‘Em! Up Guards And At ‘Em…presumably to catch the pigeon that once again eludes these indie spooks. It’s also the title of the third long player from the Yorkshire lads, picking up from 2007’s Wait for Me and Emergency, from 2008. The band have spent the intervening years constructively – supporting bands like James and the Kaiser Chiefs, working the festival circuit, and also headlining in their own right – at Ally Pally in London and playing to 14,000 bods over two nights at Leeds’ Millennium Square. As a Northern-born band with a, hmmm… quaint moniker from the hallowed pages of the Book of Kooky Rock Band Names, they naturally fall into the same camp as acts like Arctic Monkeys, the name matched by a similar drive and rough energy to the music. They’re also not a million miles from British Sea Power – a band I recently reviewed, both live and recorded – but this album is a notch above – each cut more sculpted, of a piece, with an infectious quality to tracks like ‘Lost’. Demoed whilst on tour, and further worked up back in Yorkshire, the album was ultimately recorded in New York by Justin Gerrish and does benefit from a kind of scruffy, East Village Boho chic.Tracks like the one used to preview the album – ‘She Wants Me’ and ‘Go At it Completely’ – have an almost Strokes-like feeling – at least to the music. The vocals, meanwhile, are more East Yorkshire than East Village, the lyrics across the album speaking to English ears. Curly-haired singer Matt Bowman has a gift for a tight lyrical twist – not as overly-permed as Alex Turner’s wrought wranglings, but neat, nevertheless. On ‘Lost’ he sings, “This city’s just a place to lay my head / Sleep It Off / Coming Down/ Hearing Voices” – evocative stuff.